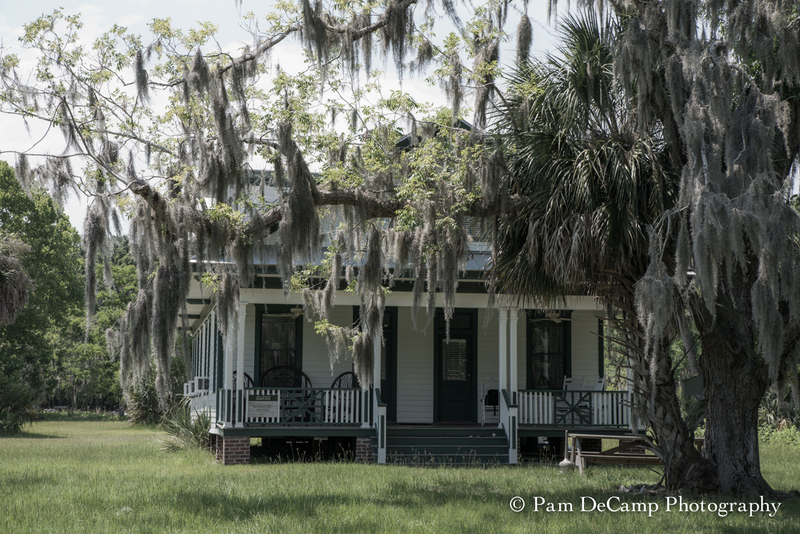 My friend Julie Thayer and I decided to take a road trip to Savannah, Georgia. Since we are both a little short on funds we decided to pull my little Towlight camper and stay at the KOA in Richmond Hill, Georgia. During the short planning stage of our trip I discovered a small island not far from where we were staying called Ossabaw Island. 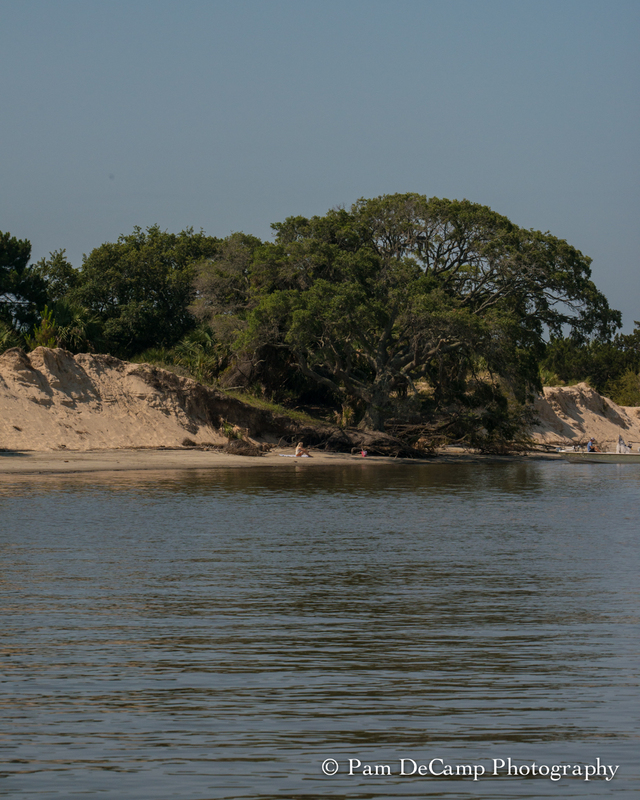 Ossabaw Island is the 3rd largest barrier island along the state of Georgia. 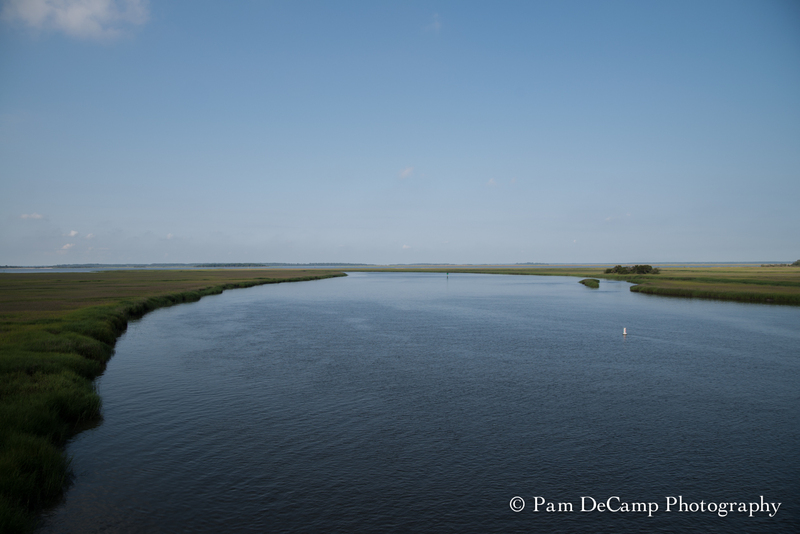 It has over 26,000 acres of land, beach, and marshland. 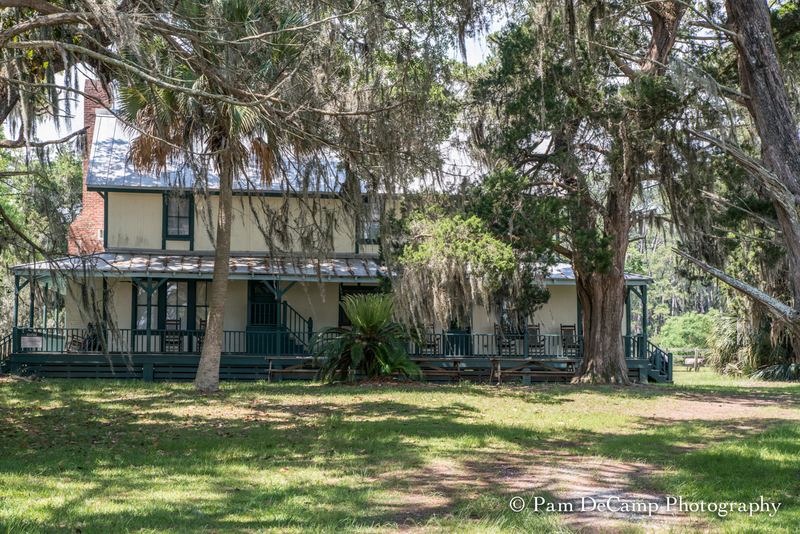 Dr. Henry Norton Torrey purchased the island in 1924 and built a home there. The home was a 20,000 square foot Spanish revival house. The family was from Michigan and would winter in Savannah. When daughter Eleanor (Sandy) was 10, the family’s home burned and they moved to Ossabaw Island. Sandy and her husband Clifford West established the Ossabaw Foundation in 1961, operating the Ossabaw Island Project and Genesis Project as well as funding scientific research, public use, and educational programming on Ossabaw. 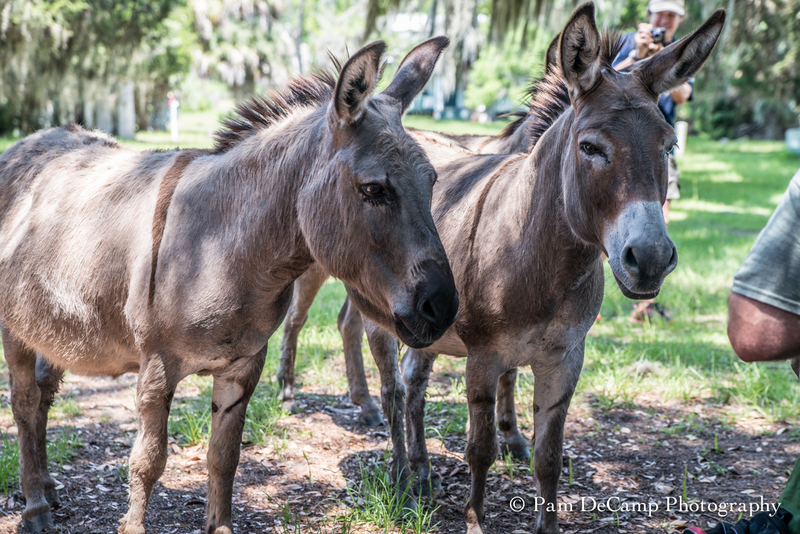 In 1965 Sandy learned about several donkeys needing adoption from a former breeder in South Carolina so she had them brought to the island as pets for her children. 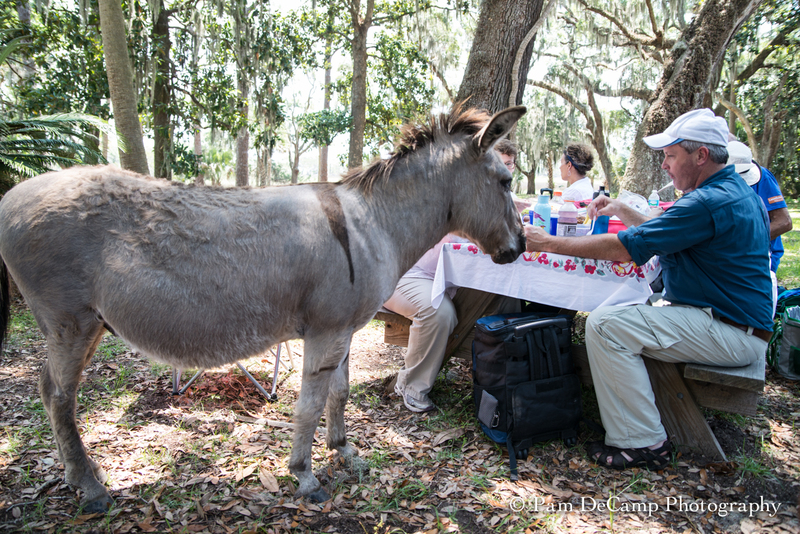 The descendants of those donkeys still inhabit the island. In 1978, Sandy sold the island to the state of Georgia due to the tax burden of the rising property value of the island. 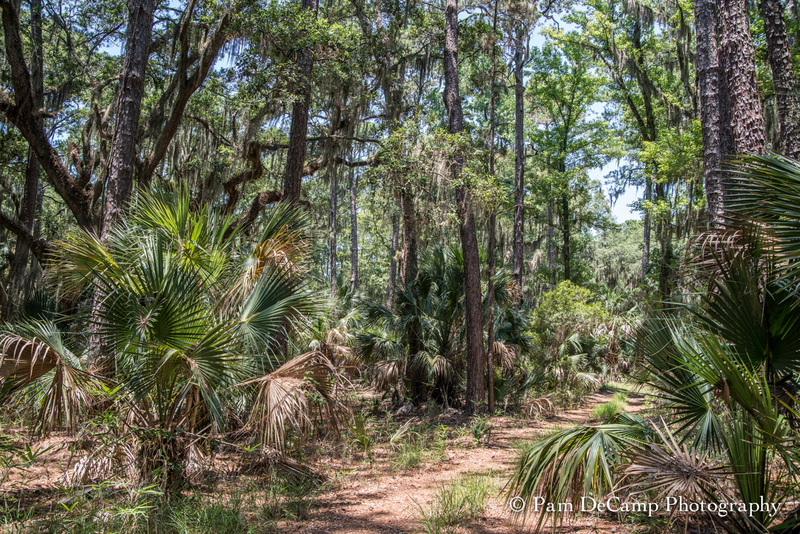 The sale stipulated that Ossabaw Island be declared Georgia’s first heritage preserve–set aside in perpetuity for scientific, educational, and cultural uses only. Sandy at the age of 102 still lives on Ossabaw Island. Opportunities to explore an island like this are rare. The foundation offers few tours and workshops each year. I was happy to discover that they were offering a tour while we were in the area. The tour was an educational tour; it was posted as a “creative trip” to Ossabaw. 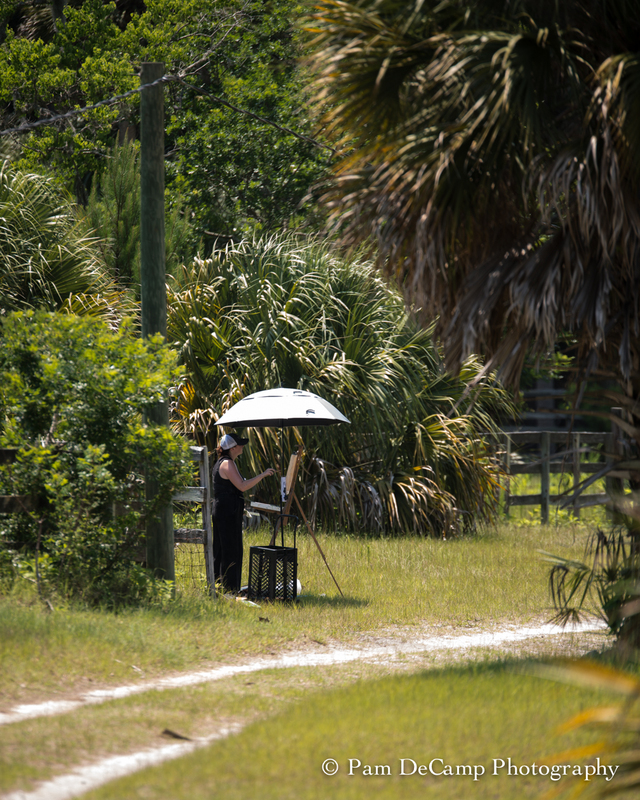 Many of the passengers on the tour were painters, writers, photographers, and historians. 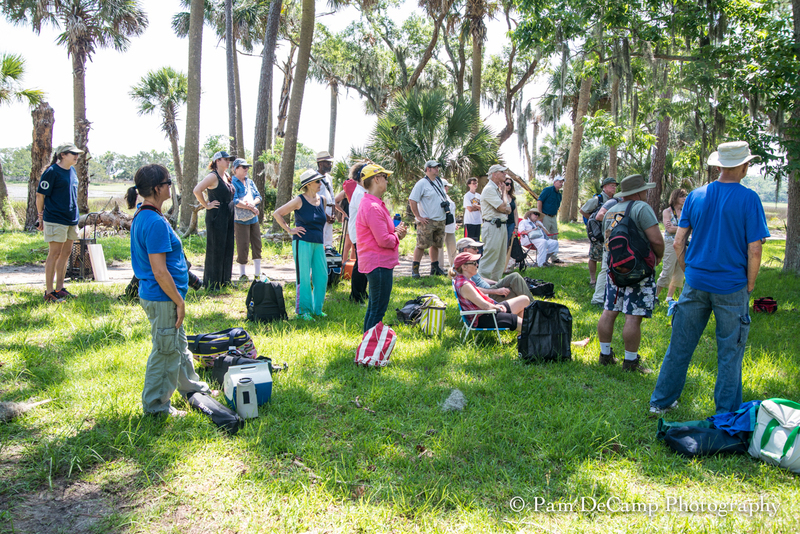 It was nice to be among those who were there to absorb the beauty and the mystery of the island. 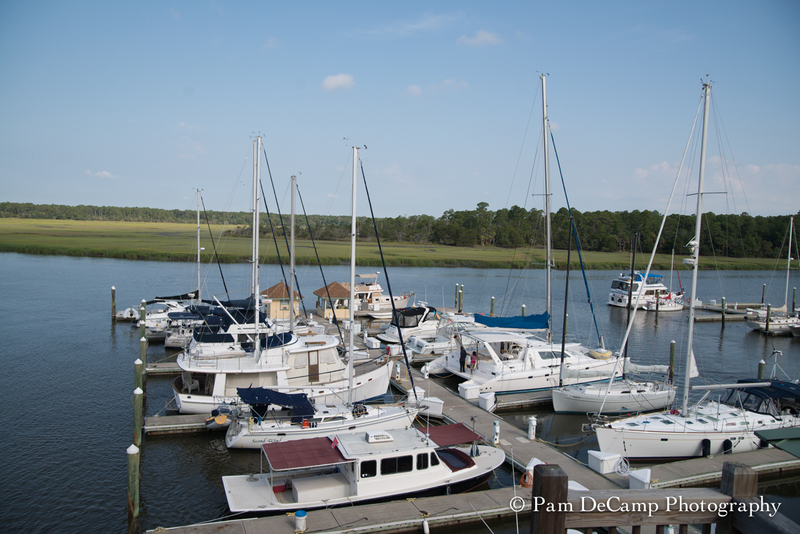 We departed Delegal Marina at the Landings around 9:45 a.m. Our Captain was Mike Neal of Bull River Cruises. He, too, was very knowledgable in the history of Ossabaw Island. 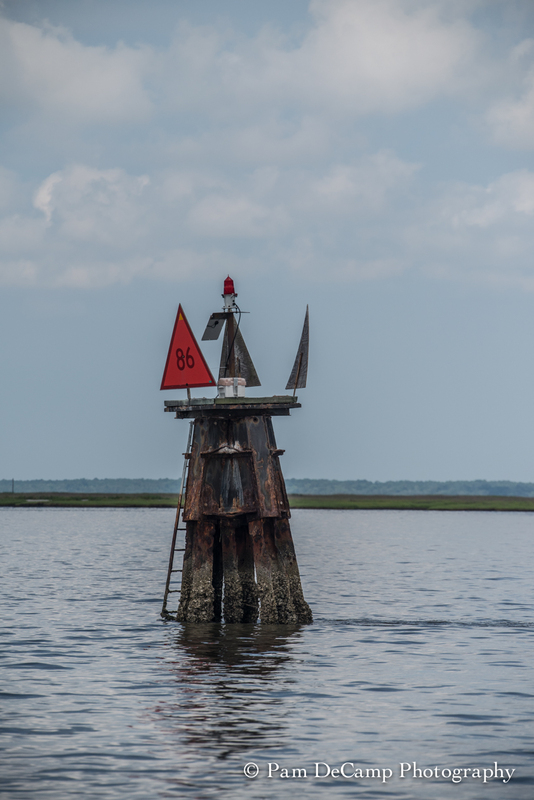 As we left the marina we drove through the marshlands and along side of the boat we saw dolphins, and a variety of birds. 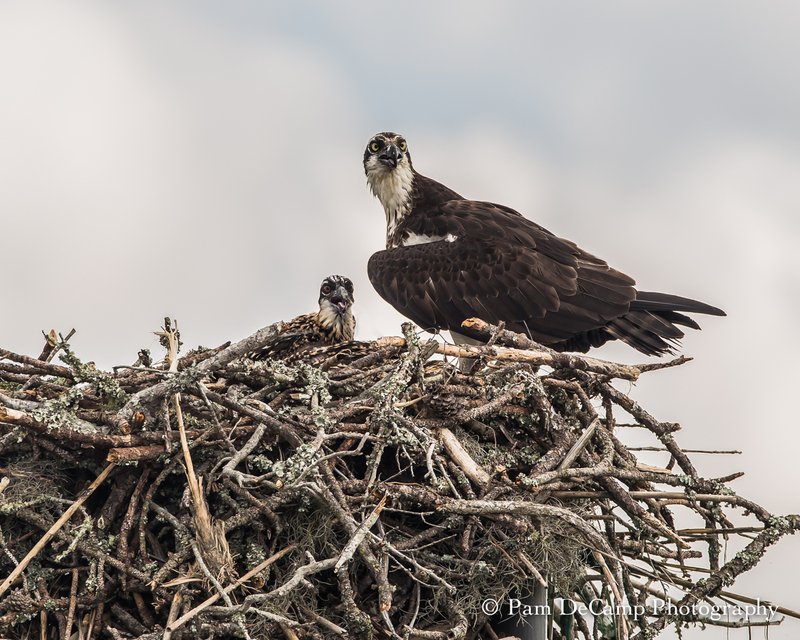 The highlight of the trip out to Ossabaw Island was seeing a momma Osprey and her babies. In the photograph below you can see only one, but on our return trip we saw 3 babies in the nest. 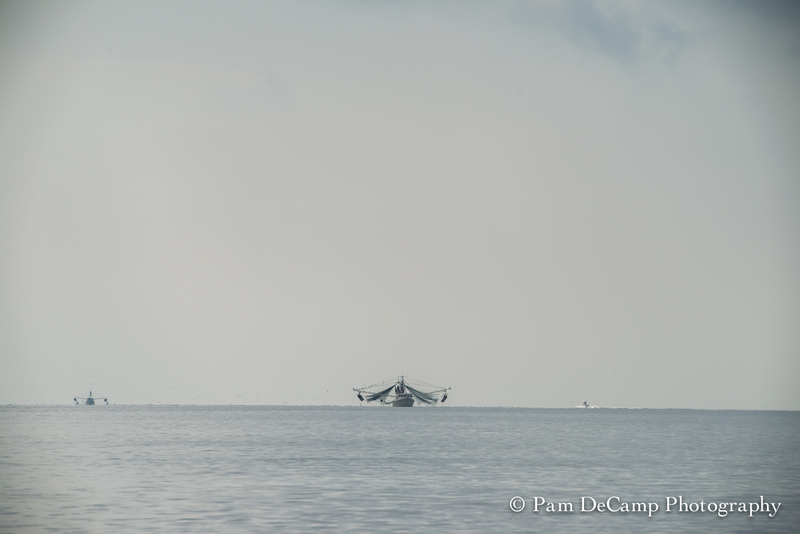 A loon surveys his surroundings. 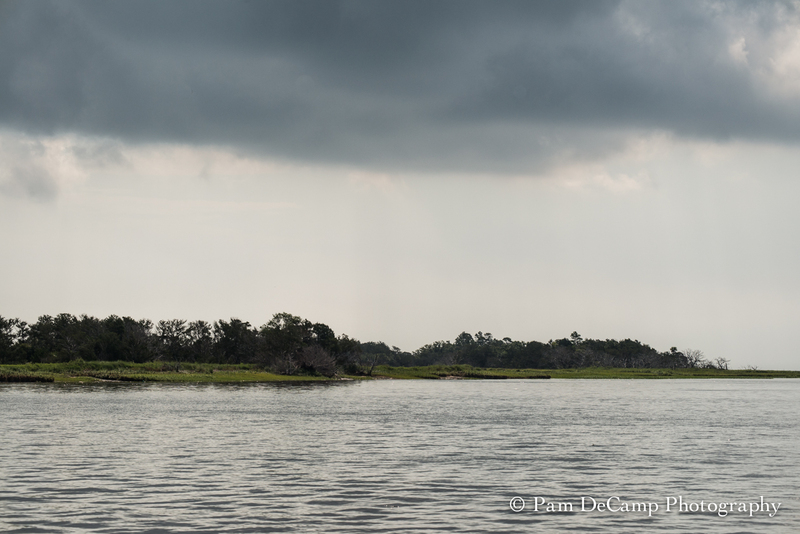 During the ride out to Ossabaw Island, all on board gravitated to the boats railings to capture the image of the dark cloud hanging over this barrier island as we passed. Many on board commented, “I’m loving this cloud” or “Isn’t that an awesome cloud”. I’m sure it will be written into a book somewhere or painted into scene on canvas. As we progressed, I kept seeing this massive boat in the distance. It looked like it had wings. I knew it was too big to be a sailboat (although a schooner came to mind). 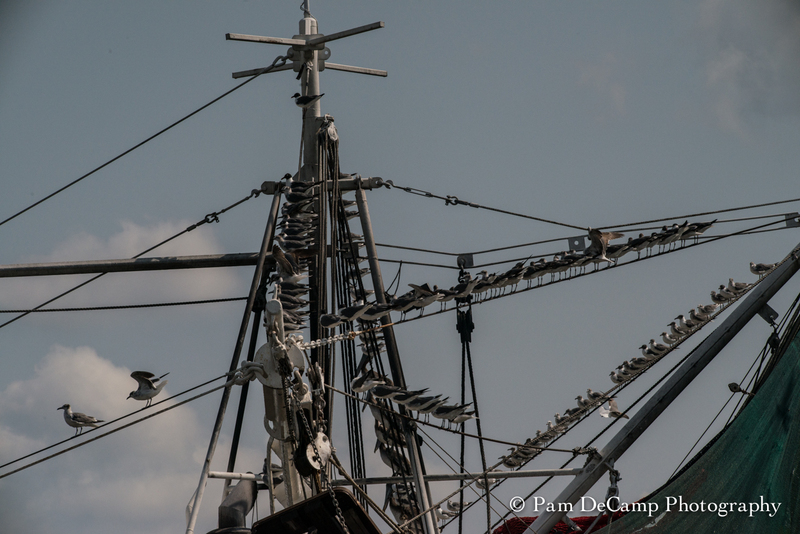 As we traveled closer to it, I realized those were nets hanging off of the masts. 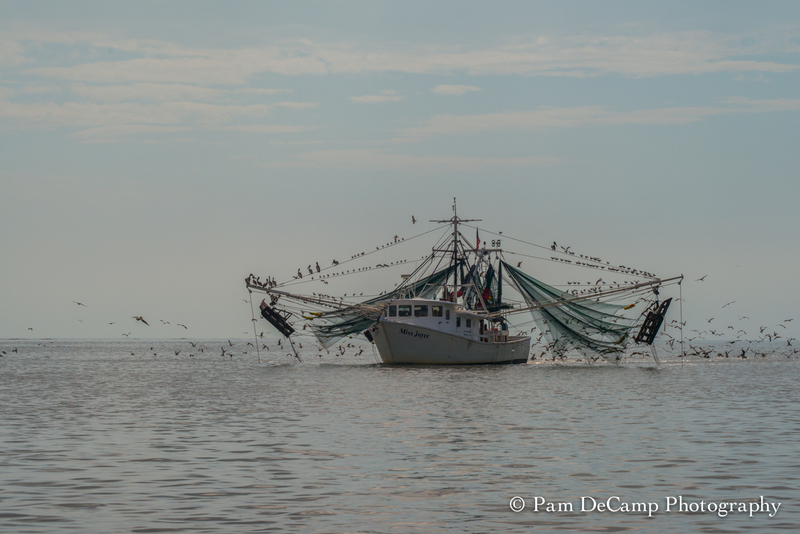 It was a large shrimp boat. 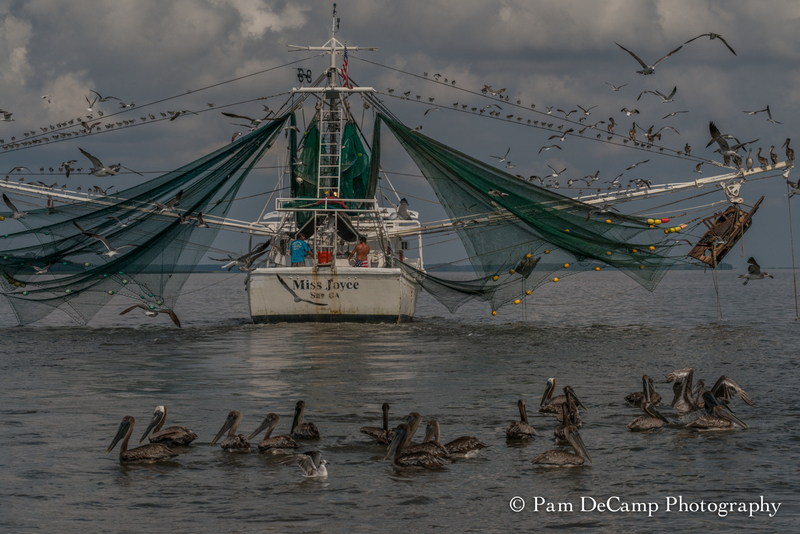 Captain Mike explained there are not that many shrimp boats any more. I was very interested in this image…I kept looking at the name of the boat; if it had been Jenny I would have laughed out loud! 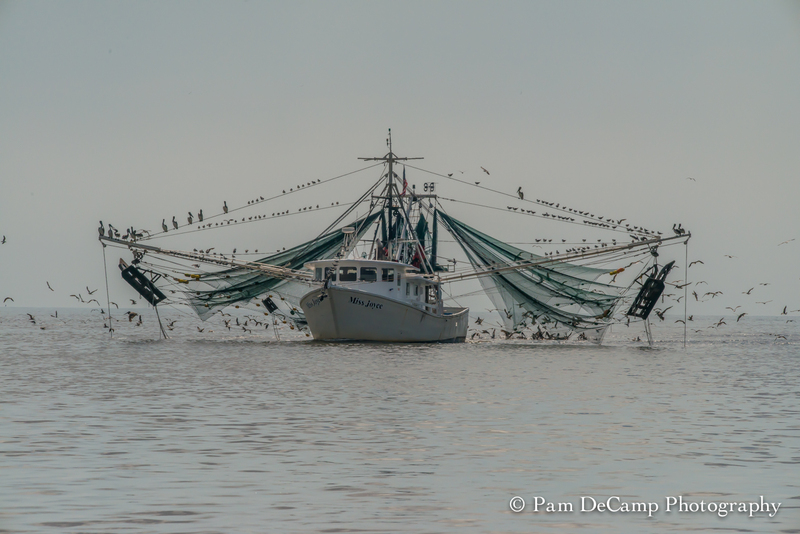 As we moved closer to the boat, you could see the hundreds of birds (seagulls, pelicans, and other water birds) flying around the boat vying for position to be ready for “today’s catch” to be cleaned and the “extras” tossed overboard. 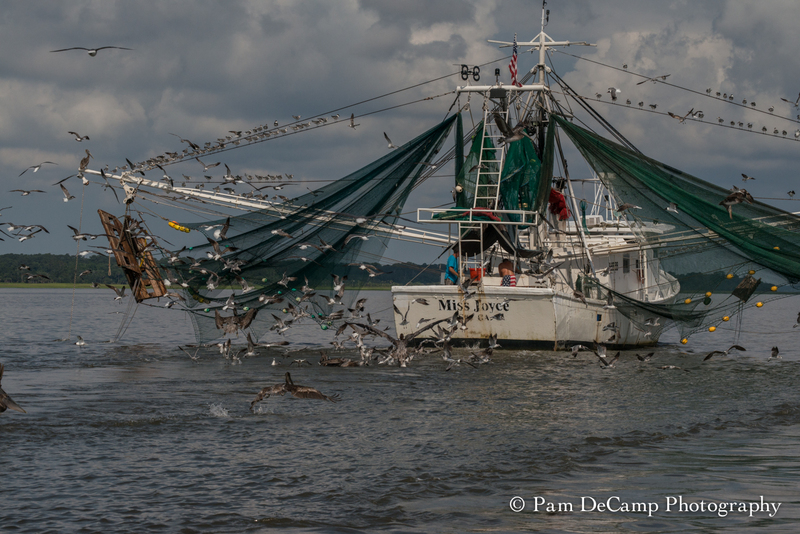 The birds were lined up on every available space of the shrimp boat. 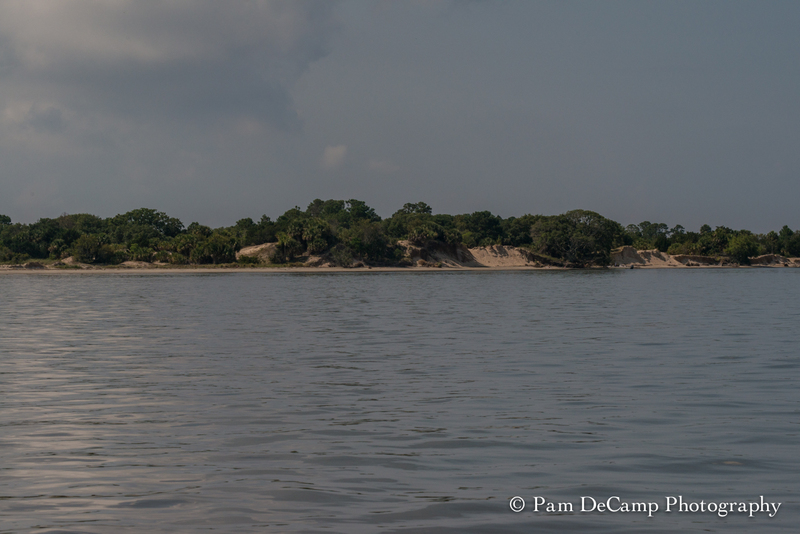 Bradley Beach was to be our first destination on Ossabaw Island. 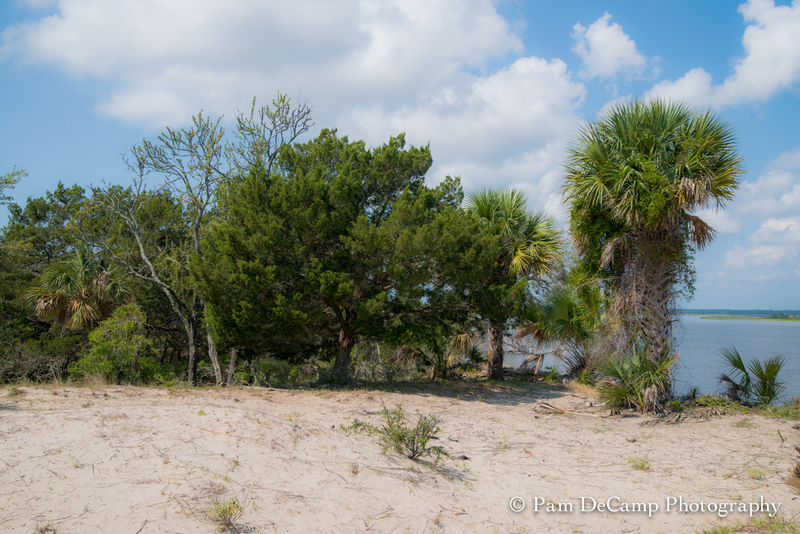 The lush green tropical trees and the high sand dunes were very inviting. I would have loved to have stayed on the beach longer than 30 minutes though. The beauty of that area was breathtaking! 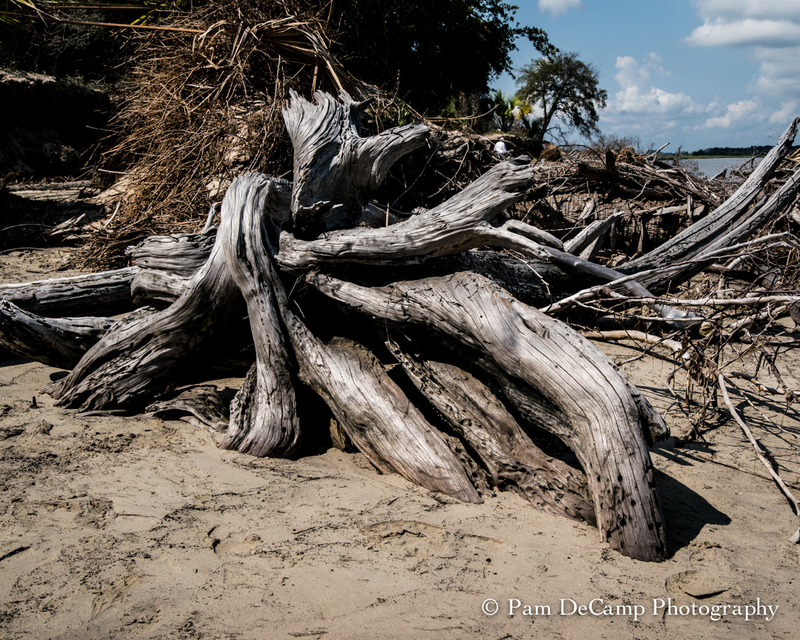 The palm trees, sand, driftwood, gave the beach its own character. The contrast of the colors and the textures were amazing! 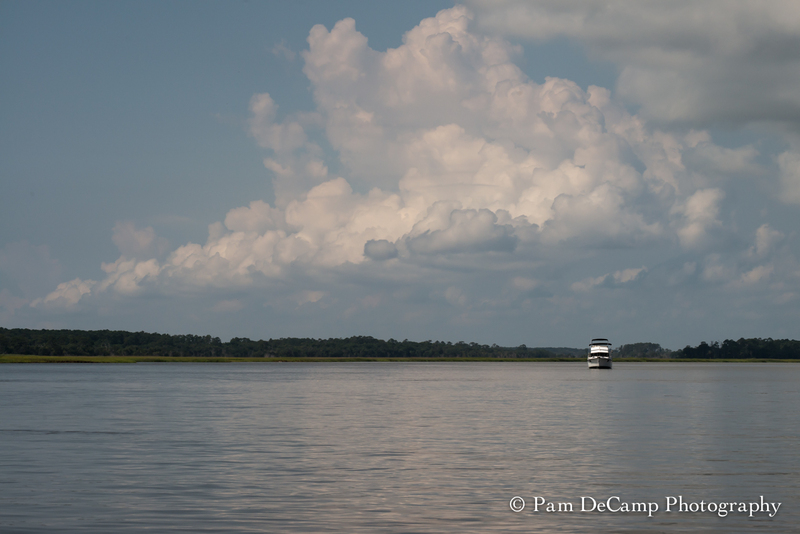 A boat in the waterway outside of Ossabaw Island. 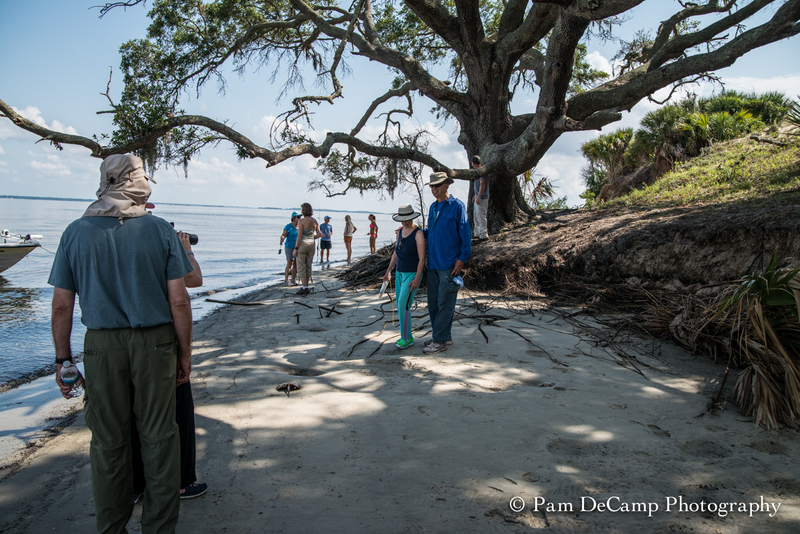 The large oak tree on Bradley Beach is used for research of the erosion on Ossabaw Island. It is rapidly eroding. 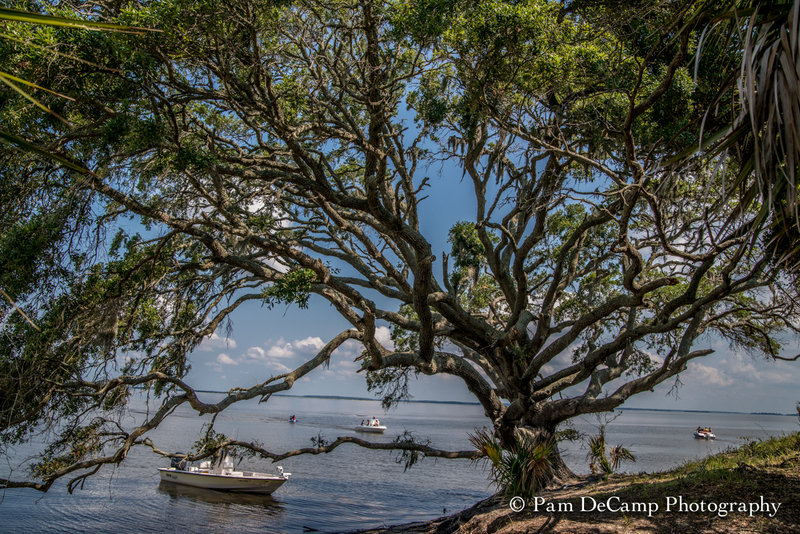 Each year the tree gets closer to the water. 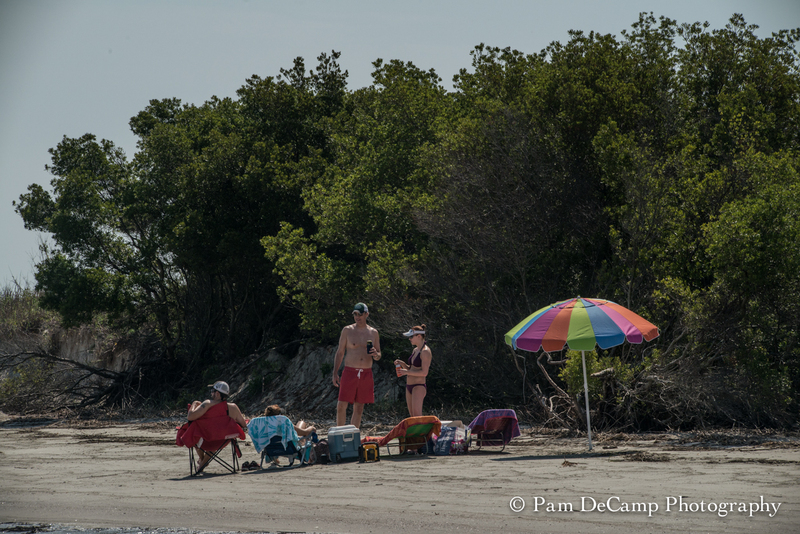 If Ossabaw Island is “private” what are people doing on the beach? Robin Gunn of the Ossabaw Foundation explained to us that the laws in the state of Georgia say that all beach front areas are public access. As long as an individual can transport themselves to and from the island between daylight and dusk they are welcome to use the facilities. 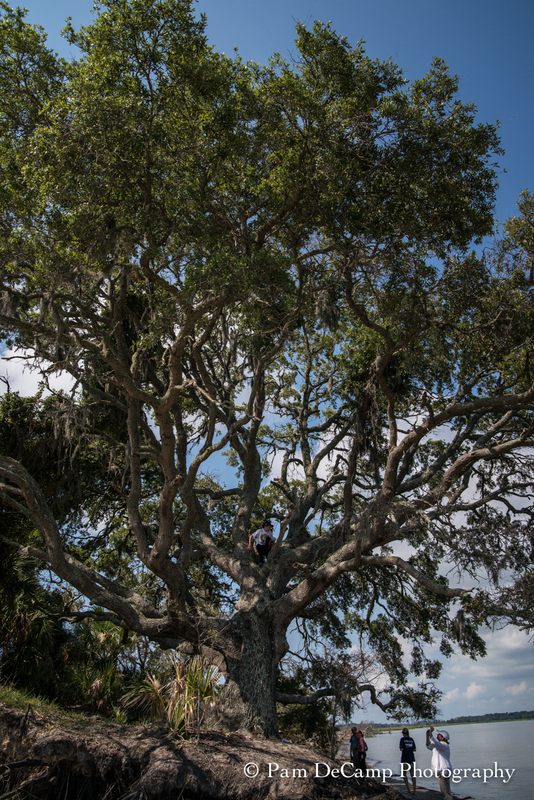 Look closely…there is a little boy in the oak tree! See how little everyone looks standing next to it? Such a beautiful tree! The young lady below was on a surf fishing trip. She managed to land a skate. She said that was enough for one day; she was going to enjoy the sun! I met a charmin lady named Iris. Her husband is the tall man in the blue shirt. We were talking about photography and she said she just became interested in it. We talked about camera clubs and I told her I was the president of the club in Huntington, West Virginia. Her face lit-up and and she said she was from Winfield, West Virginia and her husband was from a town close to Wheeling on the Ohio side! We walked and talked for several minutes. 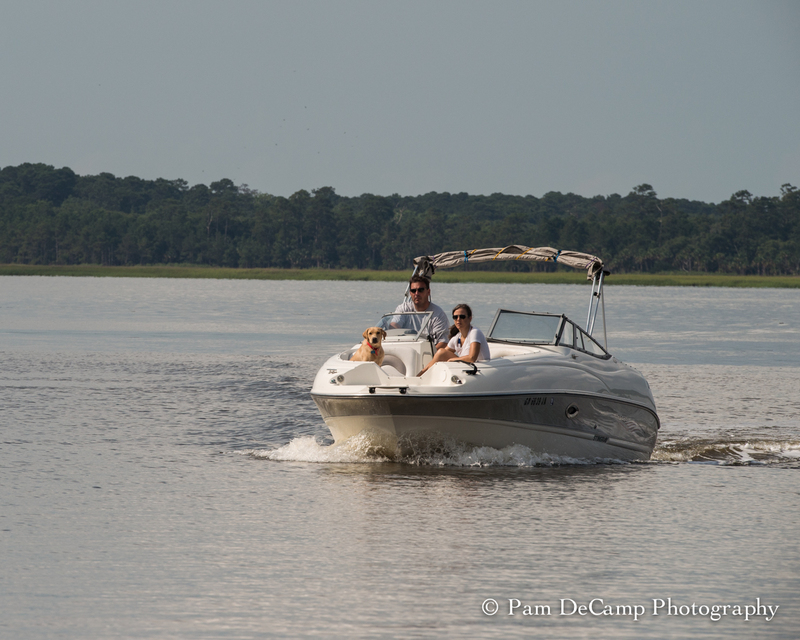 They live in Savannah and this was their first trip to the island. The lady standing on the sand dune has a magnificent tattoo on her shoulder…it is of an accordion style camera…it was wonderful! You can see how high the sand dunes are on Ossabaw. The driftwood was beautiful. These tree roots had great texture. To photograph them was challenging because they had a sheen to them. 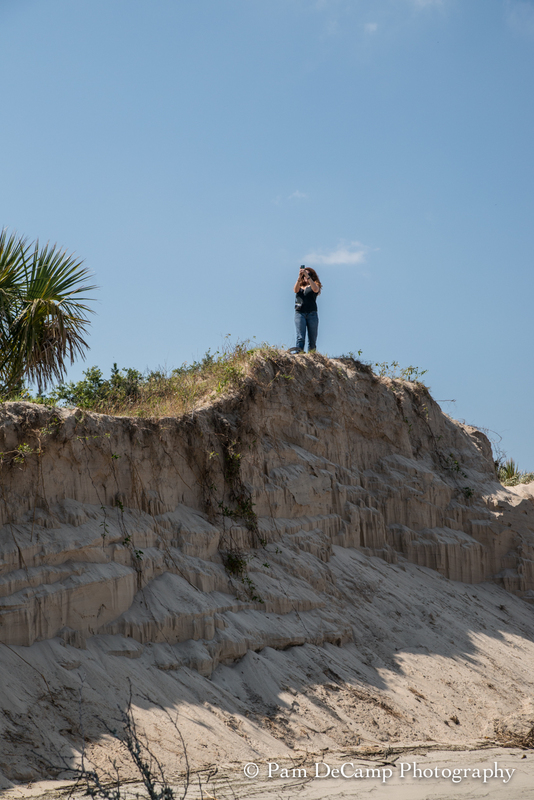 I decided to climb up on the dunes to get a better view of my surroundings. I loved this tropical scene! Another view of the oak tree. Captain Mike captured a horseshoe crab (they were close to the surface and would pop up out of the water as the waves came in) and showed us what they looked like. We saw several dead ones on the beach and he said they come in with the tide and often times they do not make it back out and die. The horseshoe crab is used often in medical research; especially in research involving the human eye. There are no edible parts to a horseshoe crab. 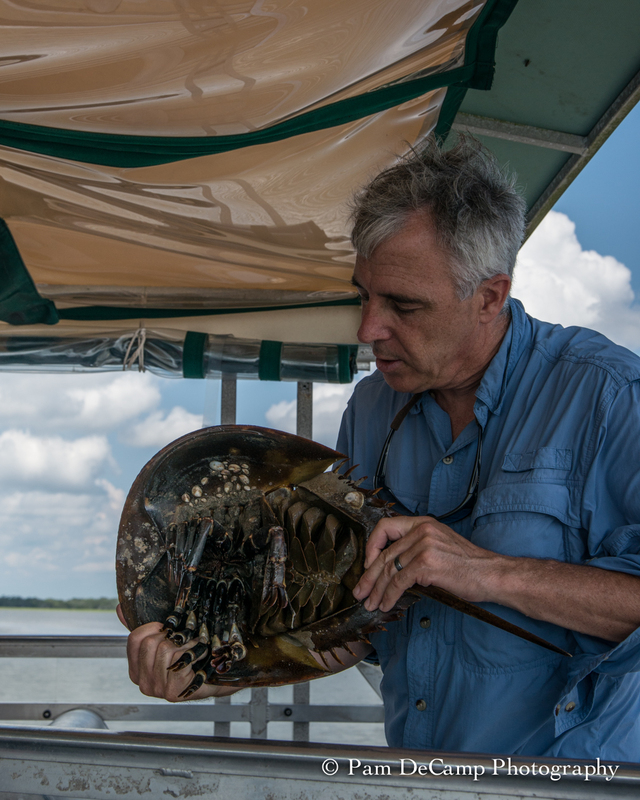 Captain Mike Neal explains the benefits of the horseshoe crab. A view of Sandy’s 20,000 square foot Spanish Revival home is not easy. 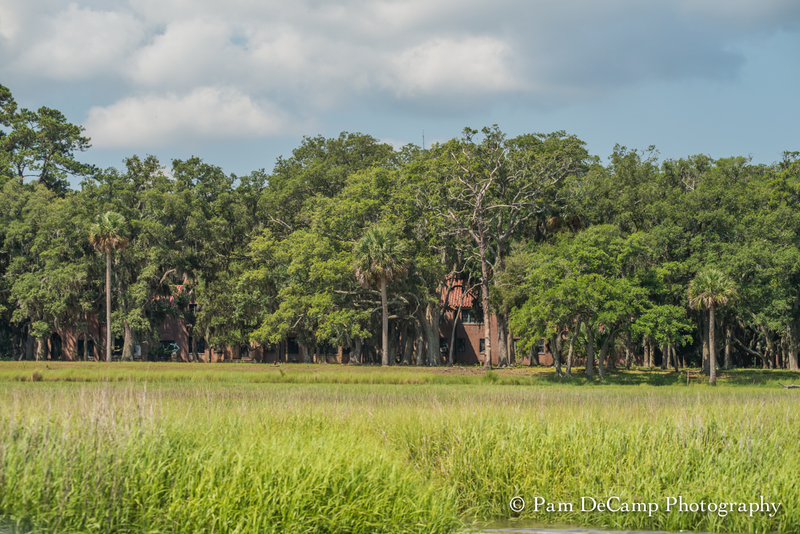 It is gated on the island and with the lush growth of trees you can only get a glimpse of it’s span from the water. The home was built in 1924 and at the time contained the largest plate glass window in the United States. You can barely see it behind a large oak tree on the left. Her family were heirs to the Pittsburgh Plate Glass Company. It is the original window. Sandy, at 102, still resides in this home. It is reportedly in poor repair, but having read quotes by Sandy, she is happy on the island she grew up on and will not leave. The tour guides shared a quote by Sandy, “I will not pass away; I will die”. Sandy has a staff of caretakers who see to her needs and provides repairs to her home. They have been the same family of caregivers for a couple of generations. They, too, live on the island. After we docked we met at the historical marker on the island. Robin went over the history of the island. As for other residents of the island there are staff of the Department of Natural Resources who live there as well. We were given our boundaries and the trails we could walk. The clubhouse was our meeting place for the day. We could stow our coolers and other gear while exploring and being “inspired”. 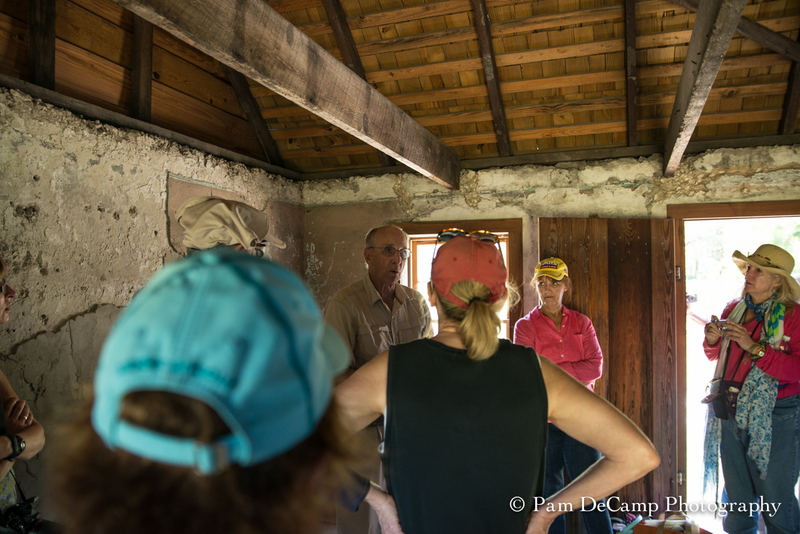 The clubhouse is used for workshops for those spending overnights on the island for research and scientific study. There are two bunk rooms upstairs and a kitchen, dining room, and living room downstairs. It would be interesting to participate in a workshop or study. They have an archeological dig going on as well. After a long day hiking, it was nice to come and cool off on the porch in a rocker. When we arrived we had about 30 minutes so we all broke out our lunches. 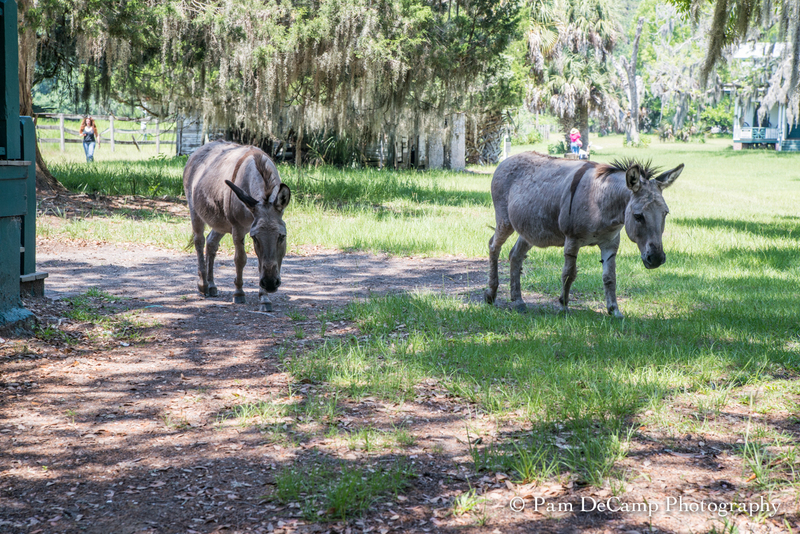 The donkeys must have a keen sense of smell because we were not even taking our first bites and they rounded the corner of the clubhouse! We were told not to encourage them, they are like really big dogs. 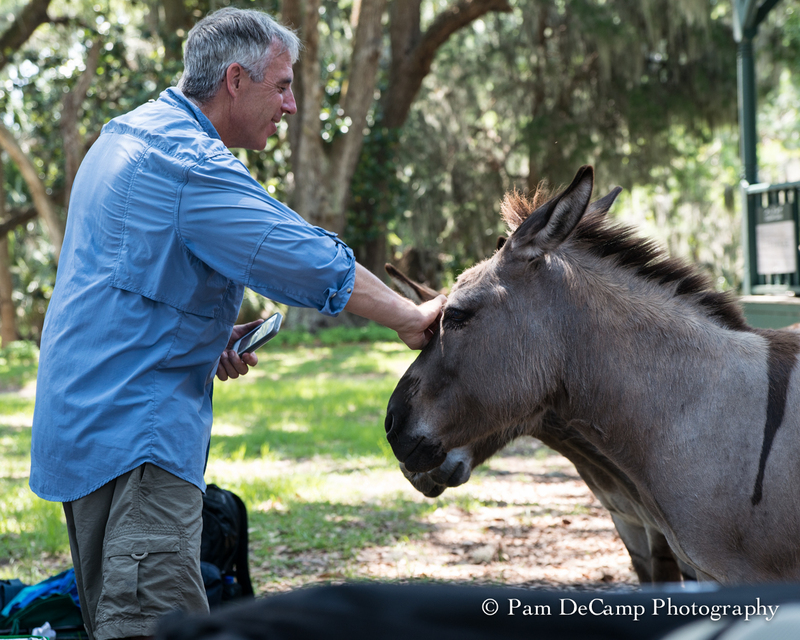 I was taken in with how close these creatures came to us and how “patient” they were. A few of the group shared their lunches with them. I’m used to big dogs and have the strength to ignore them, so they did not get any of my food. They sure tried to put Dr. Presley on a guilt trip though. They double teamed him! 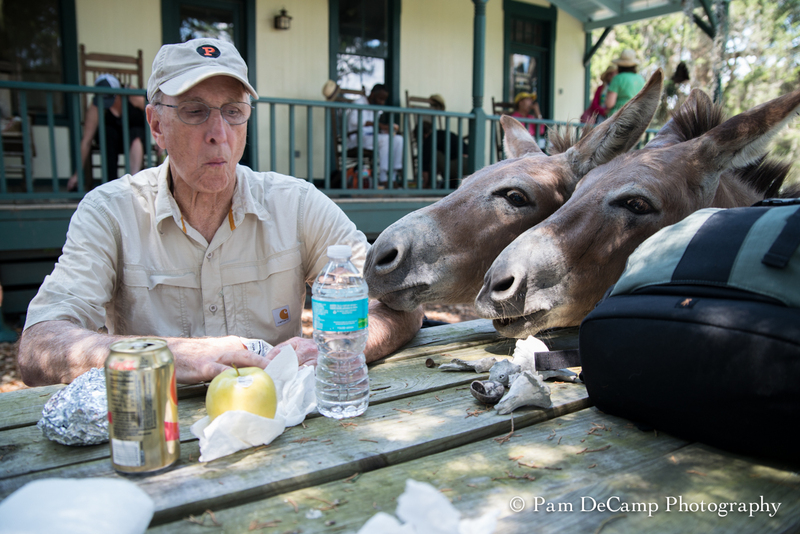 Domesticated donkeys joining the tour for lunch. Keep a close watch on your food. Captain Mike was trying to photograph them and they kept moving around. Instead they received attention and a nice pat on the heads. Mike did his best to keep the donkeys away from us while we ate. You could tell that he, too, has a great love of the island. 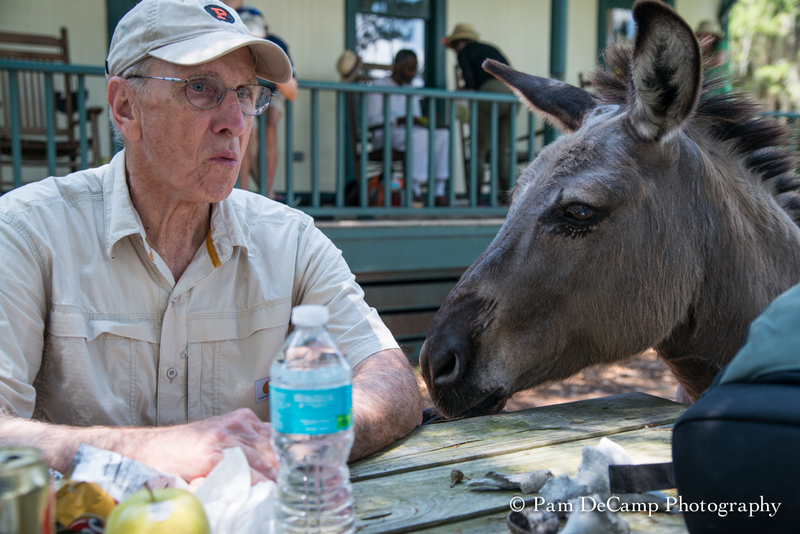 He knew much about the wildlife, life on the island, and the history of Ossabaw. If you are in Savannah, take one of his tours. He is at Bull River Cruises. 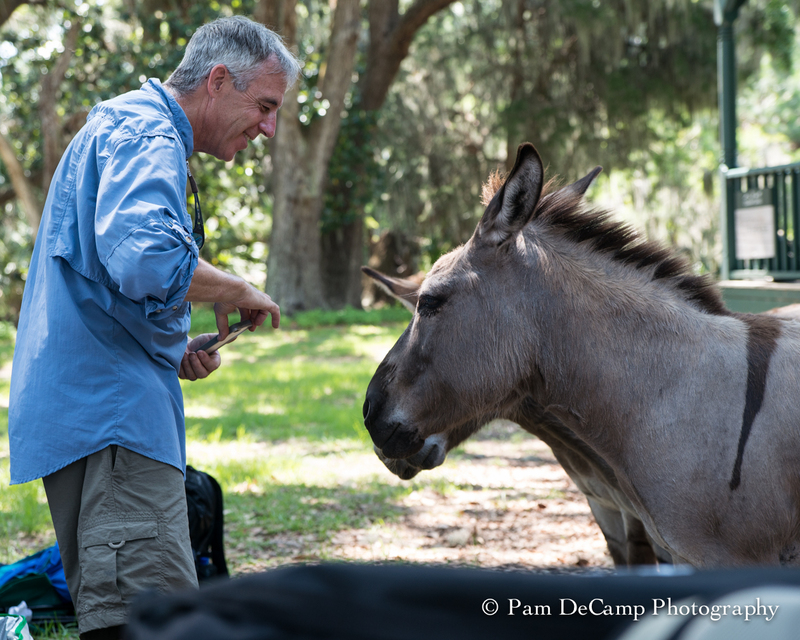 Attempting to photograph the donkeys. 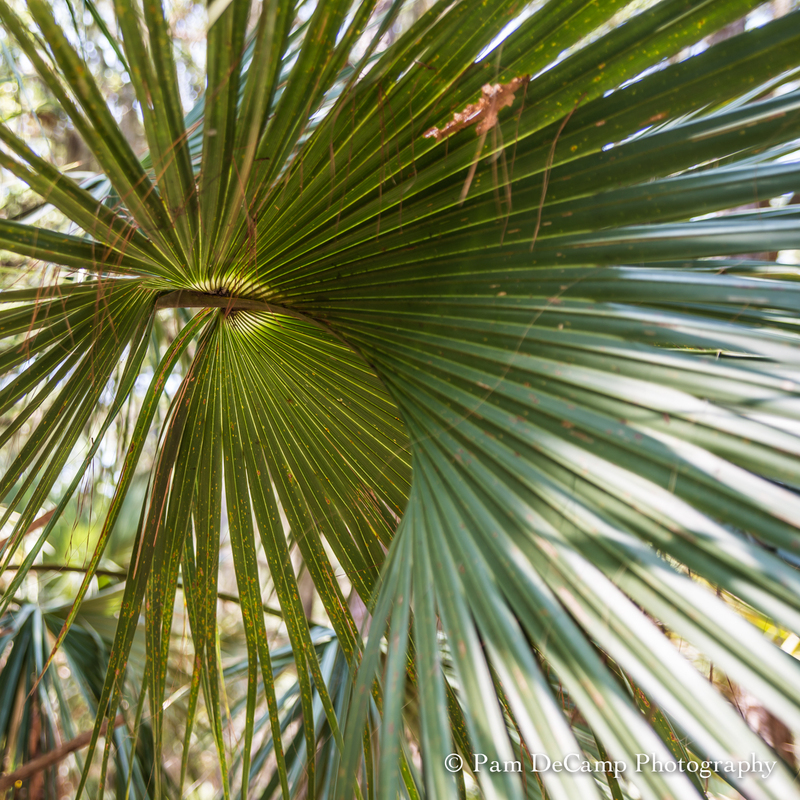 While Robin was giving us a lecture on the history of the indigo crop on Ossabaw, I heard a rustle in the palms; it was more like a rumble! 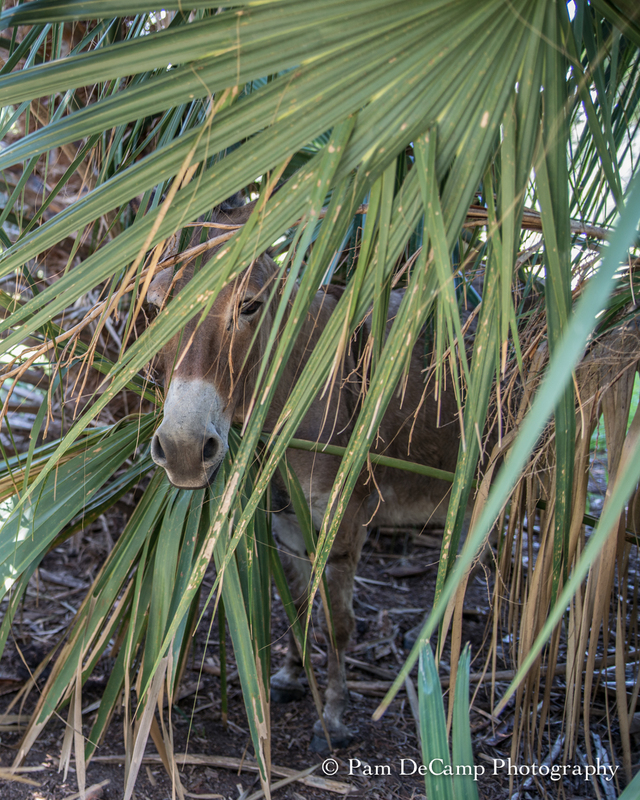 I made my way around to the back side and one of the donkeys was hiding in the palm tree. A few minutes later it made its escape by charging out during the lecture. We decided he did not want to learn about indigo! Indigo is a plant that is harvested to make the blue indigo dye for clothing. It takes several thousands of bushels to make an indigo ingot. The process is very labor intensive. From what I understood, the workers would have to fight the biting flies and withstand the high temperatures while working the vats. The longevity of the workers was short due to disease and fatigue. In the early days of the textile markets the bidding for Ossabaw indigo was high. It was reported to be the best indigo produced in the United States at the time. The indigo crop died out on Ossabaw. 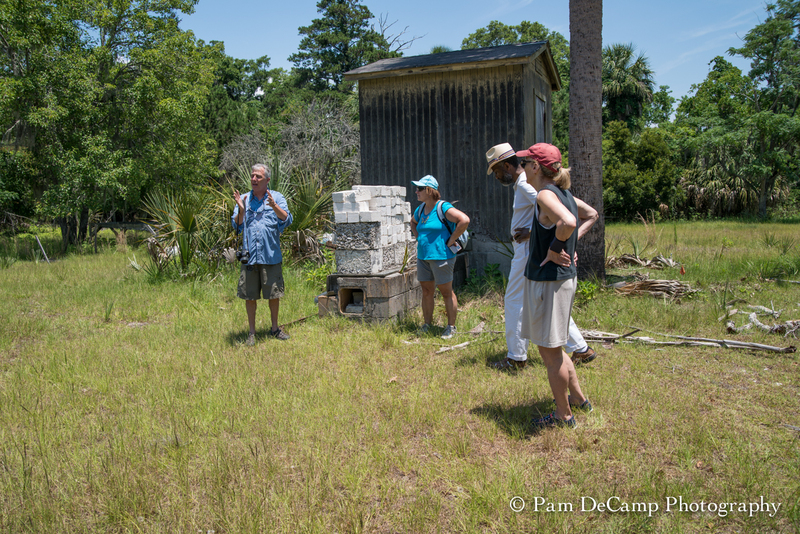 A few years ago, researchers found indigo growing wild on the island. They were able to genotype it and discovered it was a mutation from the same indigo that originally grew there. They are trying to grow the indigo on the island again. 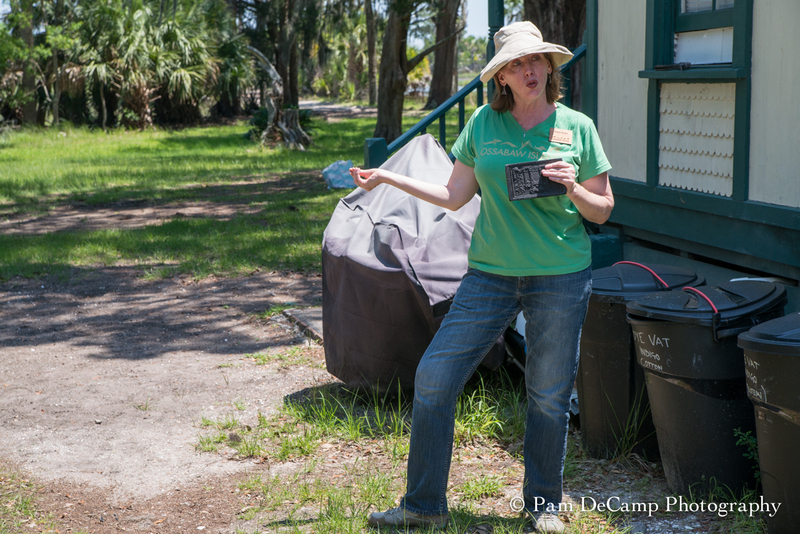 Robin Gunn discusses indigo processing. One of the historical landmarks of Ossabaw is the presence of tabby shacks. I had no idea what tabby was until I arrived on the island. Tabby is an “ancient” form of cement. It took several attempts for historians to reproduce tabby so it looked like the original. Tabby is equal amounts of oyster shell, water, and sand. All have to be void of salt. This is a barrier island and those items have to be void of salt? The tabby shacks on the island dated back to the 1700’s and at the end of the island there is a shell midden that supposedly was started by the Native Americans who inhabited the island. The shell midden had been there for hundreds of years so the shells were void of salt. The sand was acquired from different areas of the island and then the water had to be processed to rid it of the salt. 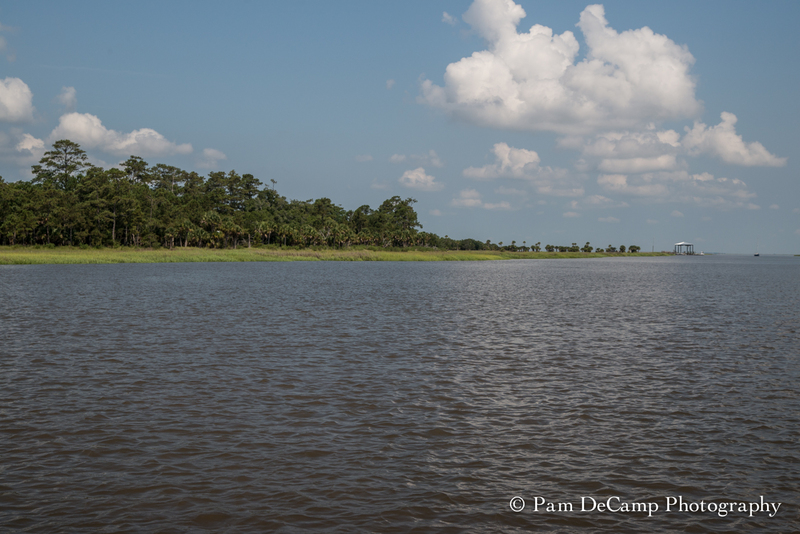 There are different tributaries that come in to the waterway we traveled. The waterway is fed by rivers and the ocean. I attempted to go view the shell midden, but the walk became too strenuous and with the heat and ticks everywhere we became discouraged. 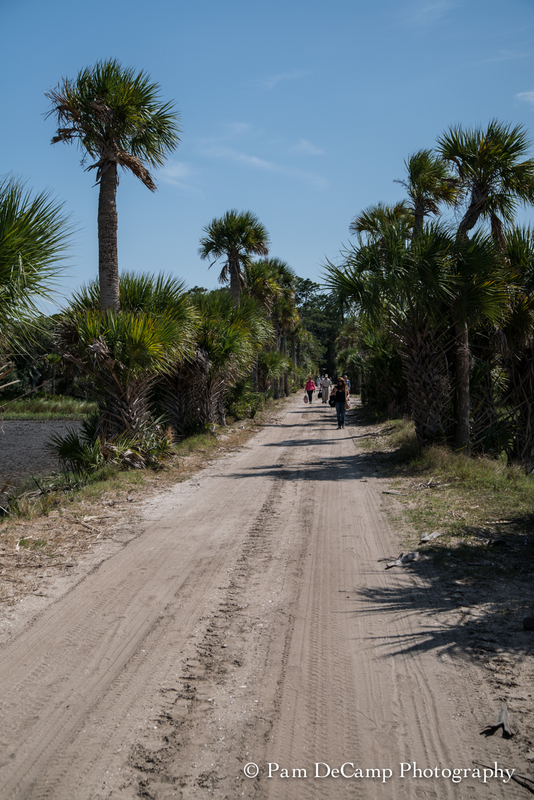 One group ahead of us said the pathway became covered in water and they turned back as well. I realized we were there during high tide so that explained the water. Captain Mike Neal of Bull River Cruises discusses tabby making. Looking inside the tabby shack you could see the primitive living arrangements. 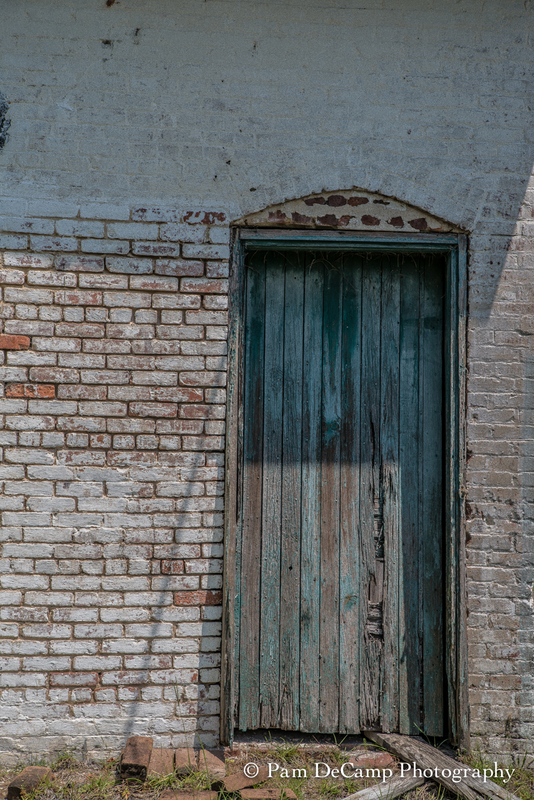 At times some of the walls were discolored in the shapes of previously present doors or windows. Each resident would restructure their “home” to suit their needs. The tabby shacks were built as duplex structures, meaning two families resided in the building. There was a fireplace in the middle, often shared by both families for cooking and heating. Dr. Presley told us about a group that had visited Ossabaw a few years back on a “reunion” tour. He said in the middle of the tabby presentation the group moved into a different room and were saying things like, “this is where I slept” or “here was my brother’s bed”. He said the entire tour grew quiet as they listened to the group reminiscing about their lives on Ossabaw. 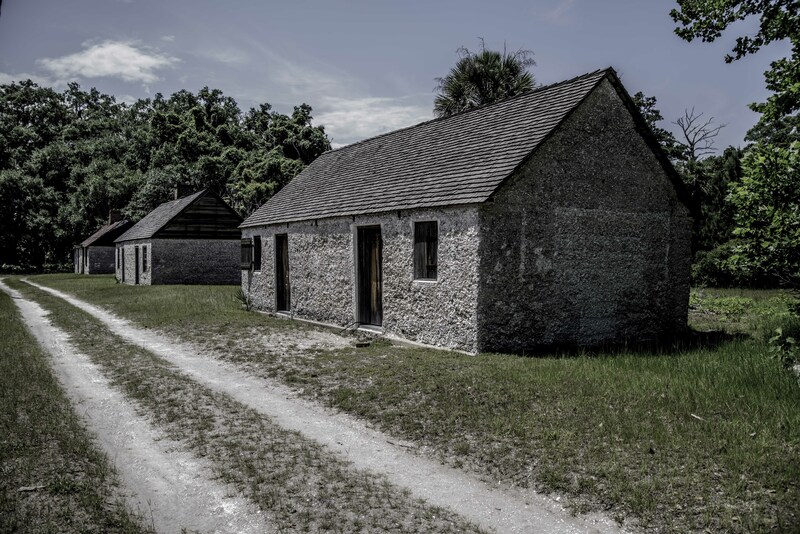 He said during a historical interview the people who lived in the tabby shacks grew up thinking they “owned” the island and that the Torrey-West family were their guests and their jobs were to make them as comfortable as possible. Talk about a “WOW” moment! The caretakers lived on the island and kept the property up all year round and the Torrey-West family would come only in the winter to stay. That was their way of life. The day we were there the temperature was in the 90’s and the humidity was at least 90%! 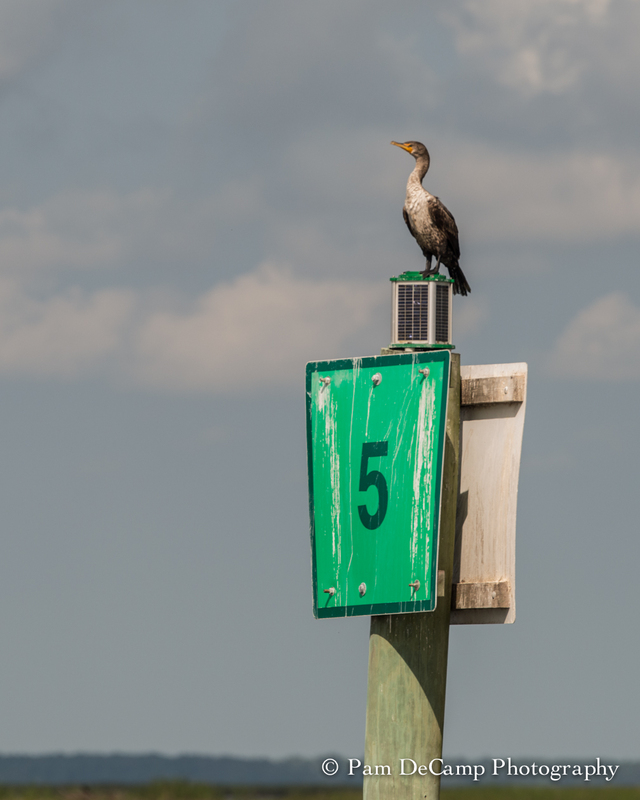 We had, what we thought, plenty of water, bug spray, sunscreen, and our camera gear all ready to capture birds and whatever else we found down the dirt road leading to marshlands. 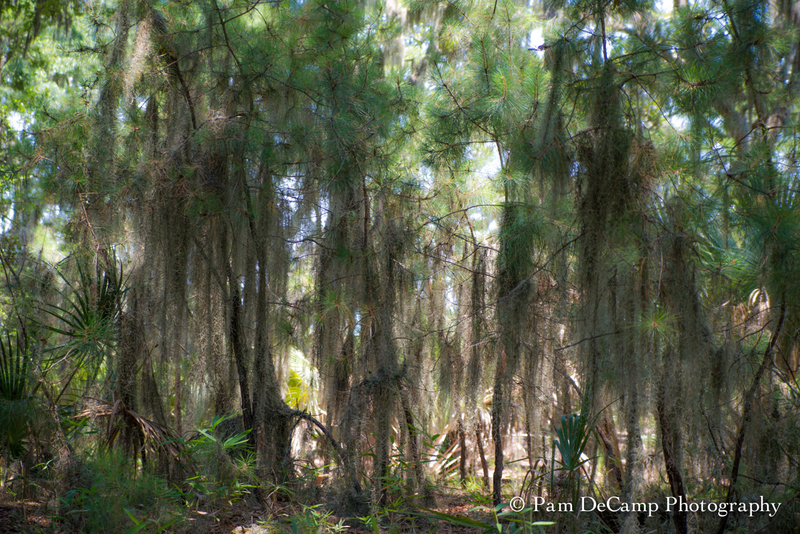 Instead we were limited to photographing the lush green trees and moss along the way. We walked for about 30 minutes and Julie discovered multiple ticks crawling on her and her gear (yes we used bug spray and reapplied a couple of times). I did not see any right away. There was a group ahead of us, who turned and came back out as well, for the same reasons. Lots of walking not much to see and an invasion of ticks! Once back to “civilization”, I stowed my gear on the boarding house steps and went to the clubhouse for more water. I took my water to the boarding house and removed my shoes and socks to let my feet cool! I enjoyed the tranquility of the boarding house porch and listened to the birds singing and watch the painter in front of me work on her creation. 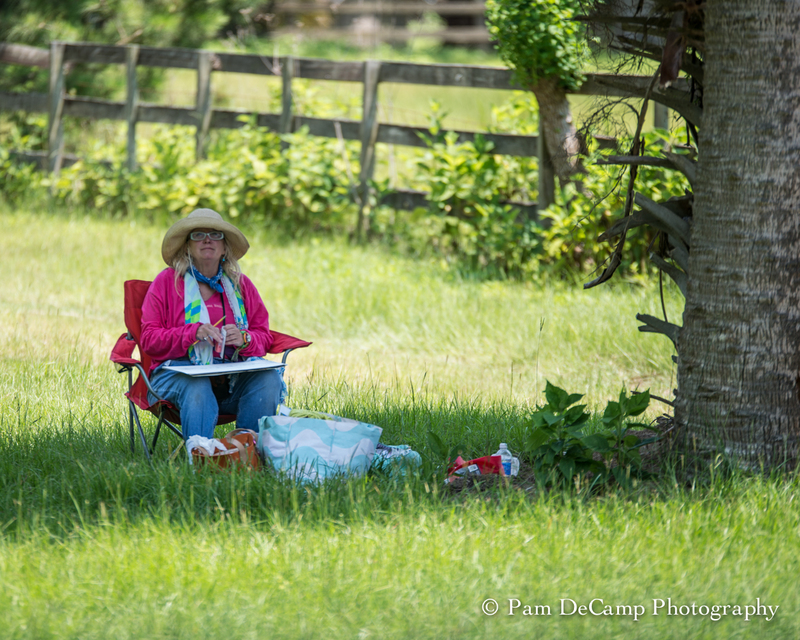 All of a sudden she stopped and laid her canvas down and said, “Well, that ruined my day! A tick just landed in the middle of my painting!” She said she could not concentrate now. I agreed with her that definitely was a “creative killer”. One of the painters started early. 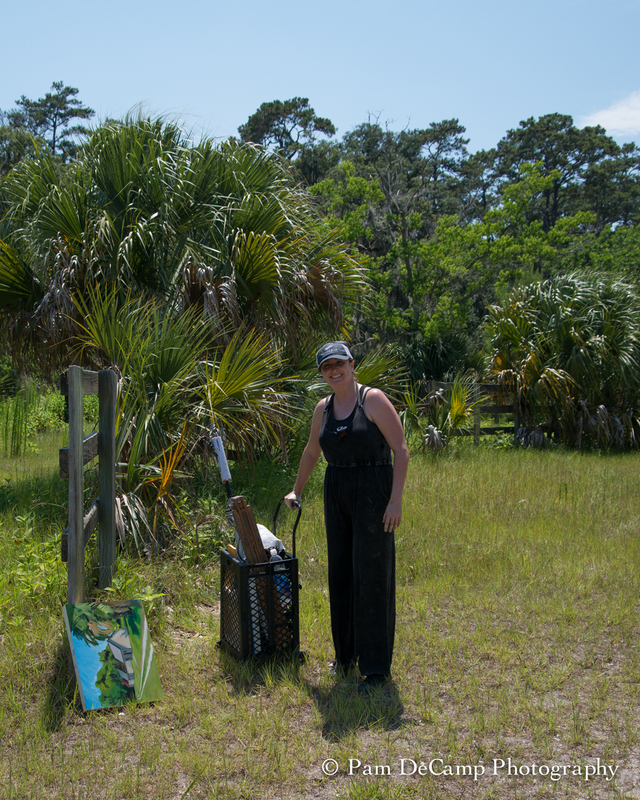 She did not participate in the indigo talk and began painting the tabby shacks. She worked on them the entire time we were on the island. She said she would finish it when she returned to the mainland and that she only worked outside. The setting for the boarding house was like that out of a romance novel. I peeped in the windows and the decor was very elegant and very southern. 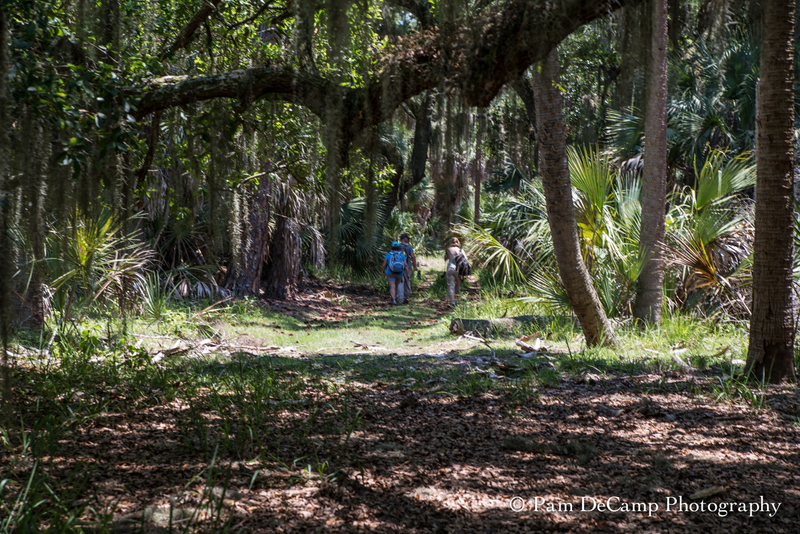 Again, it would be nice to stay there a while and enjoy the peacefulness of the island…without the ticks of course. 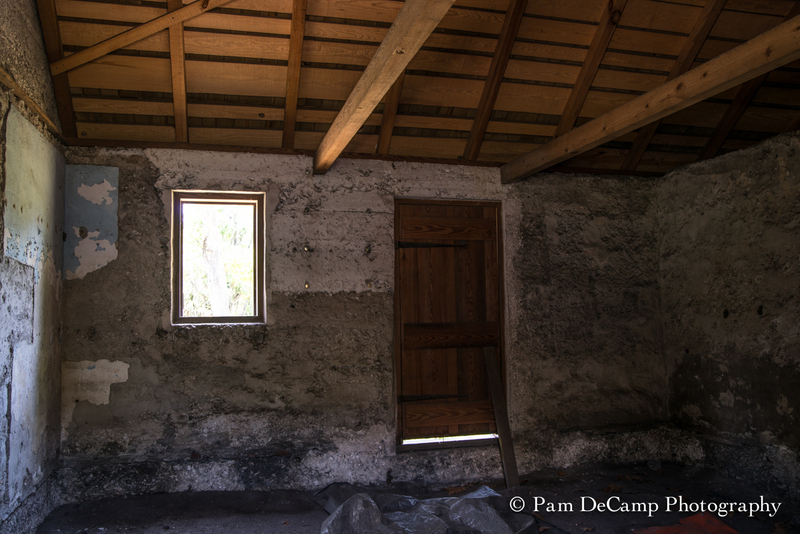 The smokehouse was the oldest tabby structure on the island, dating back to the 1700’s. It had been built onto several times and remained functional into the 20th century. There is a gravel road that runs through Ossabaw. 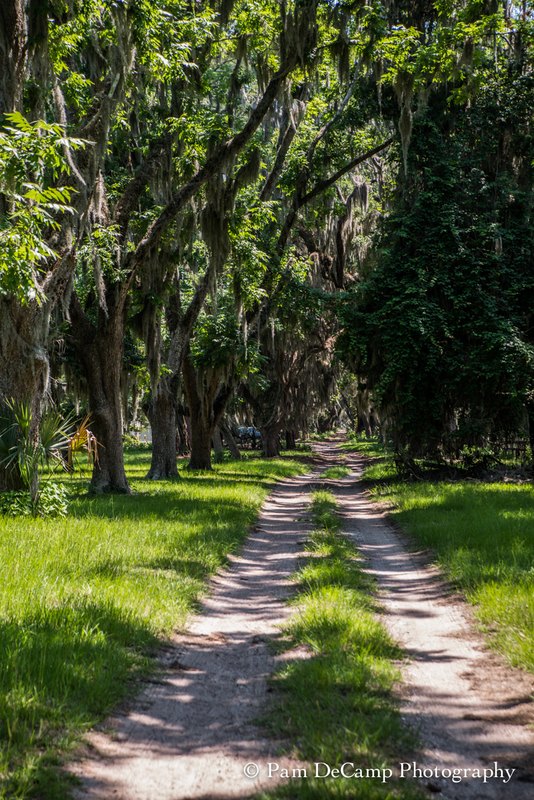 It is the longest, active, gravel road in the United States. It is 7 miles long. The beginning of the road is lined with oak trees. 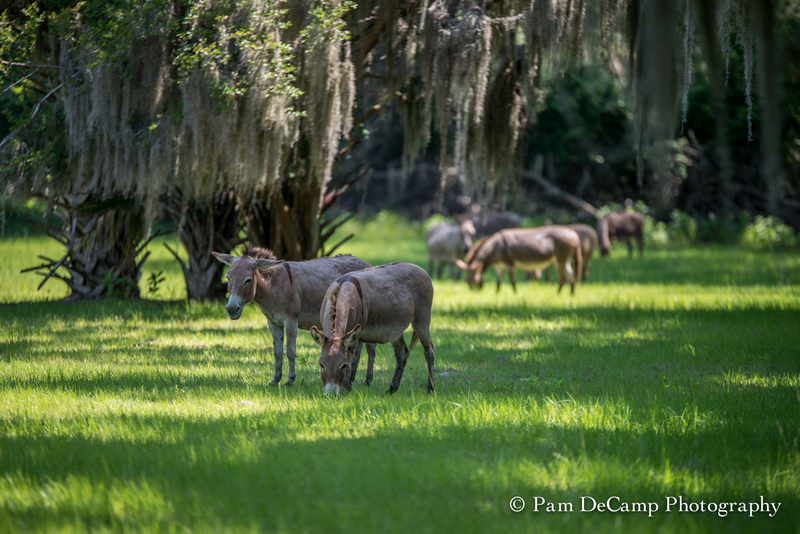 By the time we were ready to leave the donkeys had taken to the field to graze on grass. They gave up hope of a few snacks from the tourists! 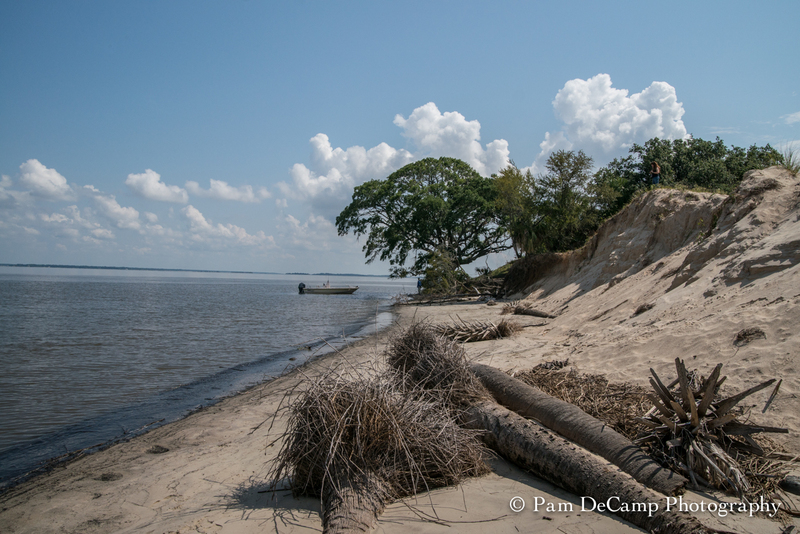 After a long hot day on Ossabaw, the 1/4 mile walk to the dock was met with mixed feelings. For the creatives in the bunch we learned a great history lesson about our past. The writers in the group have plenty of imagery to work with as well as enough information to do character development about life on a tropical island. 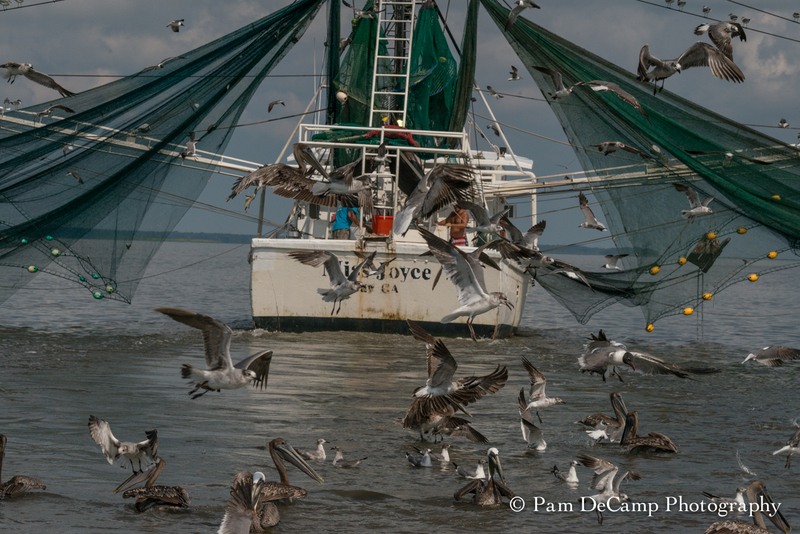 I enjoyed hearing the stories and capturing the images. While I would have enjoyed a longer stay, the ticks ruined my excitement and the humidity exhausted me. Would I go back? Yes, and I would do things a little different. I would love to participate in one of the workshops or an archeological dig. I think that would be very interesting. I can understand Sandy’s love for the island. The solitude and pureness that exists here is something you can only experience on Ossabaw.